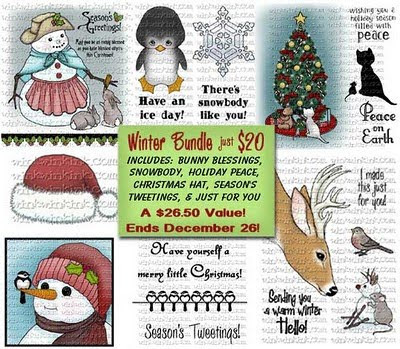 Amy's Creative Pursuits: Wink Wink Ink "Just for You"
I really like the deer image and how you had him positioned to look at the bird. Two great versions but I really like the first one because of the coordinating "deer" paper. So adorable, Amy! Love this new image. I feel so sorry for you having to do the retail thing with what can be a bunch of nasty shoppers on a Black Friday! Yikes. I think my level of respect for you just went up a few notches. So adorable, Amy! Love it! Totally adorable Amy! Love the sweet image and your colouring is perfect! So sorry it has taken me ages to get here .. .. life has been very hectic. Do you get up at 3.30am every day?!?!?! Loving the deer very much. You have made such beautiful creations. Very pretty! Such a sweet image and great papers and snowflakes!